The earliest unequivocal documentation of fireworks dates back to 12th century China, where they were first used to frighten away evil spirits with their loud sound ("bian pao") and also to pray for happiness and prosperity. 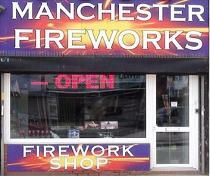 Eventually, the art and science of firework making developed into an independent profession of its own. In ancient China , pyrotechnicians (firework-masters) were well-respected for their knowledge and skill to mount dazzling displays of light and sound. 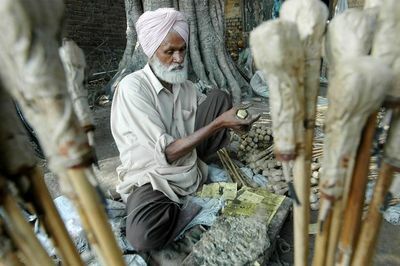 Some sources suggest that fireworks may have originated in India, but in the October 18, 2003, online edition of The Hindu, an Indian national newspaper, the Chinese are credited with the discovery of gunpowder. Through adventurous explorers, the knowledge of making fireworks spread west, through Arabia. The Arabs called the rockets Chinese arrows. The Mongols are credited with taking Chinese rockets and gunpowder to Europe around 1241. The first record of their use in Europe are around 1258. Until the 19th century, fireworks lacked a major aesthetically essential characteristic: color. Firework display audiences of the early nineteenth century and before would not have even been able to witness colour in fireworks. Many tricks were tried to suggest that the displays had colour - like coloured glass screens in front of non-coloured fireworks - and the use of pitch, oil and resin rather than gunpowder. Another way in which earlier display audiences were kept amused without colour was by the use of 'machines'. Machines were backdrops for the fireworks, often designed by leading architects of the day. Some of these were made of fabric and wood, but others (one in Versailles was made of red marble) were permanent structures and stood long after the fireworks had been lit. The machine would often be in the form of a temple or an important building and they would hide the rudimentary fusing used to communicate the fire from one firework to another - and indeed the fireworks themselves which did not have pretty wrappers as they do today. Pyrotechnicians began to use a combination of potassium chlorate and various metallic salts to make brilliant colors. The salts of these metals produce the different colors: strontium burns red; copper makes blue; barium glows green; and sodium, yellow. Magnesium, aluminum, and titanium were found to give off white sparkles or a flash. A Chinese monk named Li Tian, who lived near the city of Liu Yang in Hunan Province, is credited with the invention of firecrackers about 1,000 years ago. The Chinese people celebrate the invention of the firecracker every April 18 by offering sacrifices to Li Tian. During the Song Dynasty, the local people established a temple to worship Li Tian. The firecrackers, both then and now, are thought to have the power to fend off evil spirits and ghosts that are frightened by the loud bangs of the firecrackers. 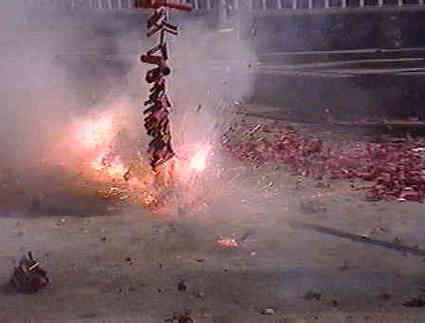 Firecrackers are used for such purposes today at most events such as births, deaths and birthdays. Chinese New Year is a particularly popular event that is celebrated with firecrackers to usher in the new year free of the evil spirits. To this day the Liu Yang region of Hunan Province remains the main production area in the world for fireworks. It is important to remember the geographic origin of fireworks, because often detractors of the fireworks industry say that fireworks are produced in China to take advantage of cheap labor. But the reality is that the fireworks industry existed in China long before the advent of the modern era and long before the disparity in east-west wage rates, and hopefully the fireworks industry will exist long after the existence of communism has an effect over the Chinese economy. Even though China invented the fireworks, Europe surpassed them in pyrotechnic development in the 14th century, which coincides with the time the gun was invented. Shot and gunpowder for military use was made by skilled tradesmen, later called firemakers, who also made fireworks for peace or victory celebrations. During the Renaissance, two European schools of pyrotechnic thought emerged: one in Italy and the other at Nuremberg, Germany. The Italian school of pyrotechnics emphasized elaborate fireworks, and the German school stressed scientific advancement. Both schools added significantly to further development of pyrotechnics, and by the mid-17th century fireworks were used for entertainment on an unprecedented scale in Europe, being popular even at resorts and public gardens. In the mid-19th century fireworks became popular in the United States. Injuries associated with fireworks, particularly to children, eventually discouraged their unrestricted use. As a result, in many states of the U.S. and in parts of Canada the sale of fireworks is now restricted by law. In the United States, fireworks arrived with the earliest settlers, and quickly became popular. The first "Independence Day" celebration there was complete with firework displays even though actual Independence was not won for six more years. This tradition has continued ever since, and large fireworks displays are part of the celebration on July 4th in almost every city in the country. It is believed that fireworks were brought to the west by Marco Polo, who was a frequent visitor to China, and European crusaders in the Middle East. The potential of these chemicals for causing destruction did not escape the early scholars in the West, but it was almost another 300 years before scientists could work out the exact formula that could become lethal, and cause a sufficiently strong explosion. 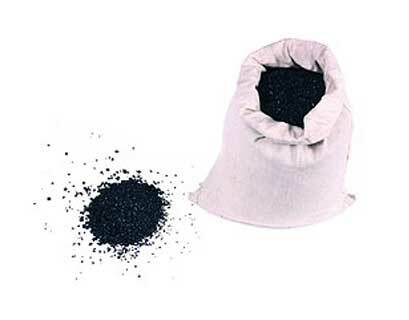 They discovered that a mixture of saltpeter, Charcoal, and Sulphur in the proportion of 75%, 15% and 10% respectively produced the desired results, and graduated to employing gunpowder in warfare using these proportions, which incidentally are valid even today. Remember, remember the fifth of November. 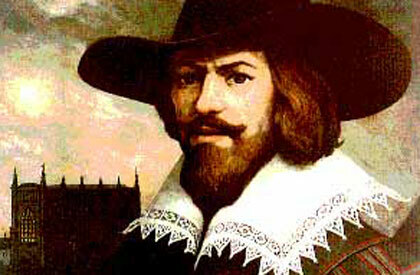 Gunpowder, treason, and plot. I see no reason why gunpowder treason Will ever be forgot - a children's rhyme about the events, still spoken today. The town of Lewes is famous for its annual Guy Fawkes Night celebrations. Local groups, 'bonfire societies' conduct torch-lit marches around the town, vying with each other for the best fancy-dress outfits and topical celebrity figures that are later burnt. The largest and probably the most impressive annual fireworks display in the UK is however held not in November, but in early September in Edinburgh . Since 1981 the world's largest arts festival has ended each year with a combination of live open air orchestral pieces (performed in the Ross Band Stand, Princes Street Gardens) whilst a panoply of fireworks are launched from the ramparts of Edinburgh Castle immediately behind. The natural amphitheater which the Princes Street area provides creates a perfect setting for enjoying the music and fireworks. Major cities around the world host a spectacular firework display on New Year's Eve . 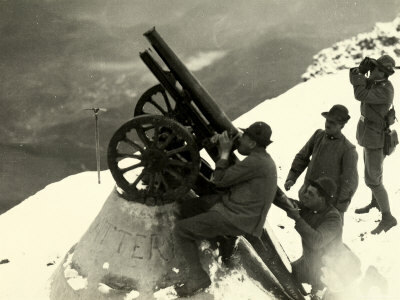 Although it is now just a custom to fire off fireworks on New-Year's eve, in the past the idea was to scare ' bad forces ' so they would not enter the new year. As a consequence the most popular fireworks are still those that go off with a big bang or with a bright flash. 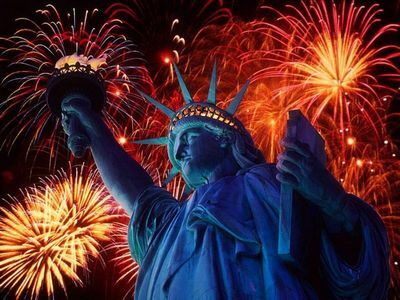 America&aposp;s earliest settlers brought their enthusiasm for fireworks to the United States. Fireworks and black powder were used to celebrate important events long before the American Revolutionary War. The very first celebrations of Independence Day were in 1777, six years before Americans knew whether the new nation would survive the war; fireworks were a part of those festivities. In 1789, George Washington's inauguration was also accompanied by a fireworks display. This early fascination with their noise and color continues today. In Ireland (both the Republic of Ireland and Northern Ireland ), during the Halloween season, there are many spectacular fireworks displays. The largest are in Derry and Dublin. The sale of fireworks is restricted in the Republic of Ireland, though many illegal fireworks are sold throughout October or smuggled over the Northern Ireland border. There is a £10,000 fine for possessing them, or a five year prison sentence. The origin of las Fallas is a bit murky, but most credit the fires as an evolution of pagan rituals that celebrated the onset of spring and the planting season. Over the centuries the Valencians have developed fireworks into a form of art for the festival. Valencia is the unrivalled Mozart of fireworks. Valencian pyrotechnic crews get regularly contracted for blowing up big world events, such as Olympics and New Year. The fireworks of the Fallas must not be missed. There are two types of fireworks during the Fallas Festival. The firecrackers. The mascleta is not visual, it is just the explosions. But remember: in Valencia it is not just noise. It is an orchestra, there are all those various types of explosions and the Valencians attempt to create some kind of simphony out of them, much like playing an organ. 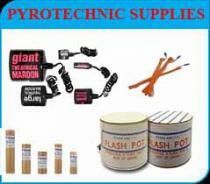 There are various professional pyrotechnic bands who compete to create the best "melody". The castillo is the visual fireworks, performed at night. Even someone who is not a fan and always finds the fireworks boring must see what the Valencians can do. It's not just a few green balls, few red balls and a bunch of white rays. It will leave you in awe with an open mouth, the shear complexity, aesthetics and artistic harmony is incredible. We can't describe it. You have never seen anything like this. Don't miss it. Eid is usually celebrated with firework displays at the end of the day. A self-propelled vertical firework wheel 25.95m 85ft in diameter was designed by the Newick Bonfire Society Ltd and fired for at least one revolution on 30 October 1999 at the Village Green, Newick, East Sussex, UK. The record for the largest firework display consisted of 66,326 fireworks and was achieved by Macedo's Pirotecnia Lda. in Funchal, Madeira, Portugal, on 31 December 2006. The world's longest firework waterfall was the 'Niagara Falls', which measured 3,125.79 m (10,255 ft 2.5 in) when ignited on 24 August 2003 at the Ariake Seas Fireworks Festival, Fukuoka, Japan. The record for the most firework rockets launched in 30 seconds is 56,405, in an attempt organized by Dr Roy Lowry (UK), executed by Fantastic Fireworks, at the 10th British Firework Championship in Plymouth, UK, on 16 August 2006. The largest bonfire had an overall volume of 1,401.6 m- (49,497 ft). The bonfire was built by Colin Furze (UK) in Thistleton, Leicestershire, UK, and lit on 14 October 2006. The world's tallest bonfire tondo measured 37.5 m (123 ft) high, with a base of 8 m (86 ft) and an overall volume of 800 m (28,251 ft). The event was organized by Kure Commemorative Centennial Events Committee, and lit on 9 February 2003 at Gohara-cho, Hiroshima, Japan, as part of a traditional ceremony to encourage good health and a generous harvest.